For now the roll out is limited, which will give Facebook the opportunity to hone the service and learn from the behaviour of a relatively narrow user group. A wider roll out will follow. For a whole host of reasons which warrant a blog post of their own, streaming music has coalesced around a very functional value proposition. In short, the fun has been taken out of music. Apps like Dubsmash and Musical.ly showed that it doesn’t have to be that way. These apps were small enough to be able to do first and ask forgiveness later. Even though Facebook has all the ingredients to do what those guys did, but at scale, it is far too big to try to get away with that strategy so had to get licenses in place first. YouTube is the only other scale player that really brings a truly social element to streaming. Now it has got a serious challenger that just upped the ante beyond comments, mash ups and likes / dislikes. The music industry so needs this right now. Especially to win over Gen Z. Is Facebook bottling it when it comes to messaging apps? For the moment, Facebook’s strategy is squarely focussed around its core platform. There’s no mention of Instagram (surely the best outlet for this kind of functionality). This hints at a degree of strategic wobbles in Facebook towers. By going all in with its messaging app strategy Facebook took a brave move few big companies do: it decided to disrupt itself before someone else did. It realised that the future of social was in messaging apps not traditional social networks. It is now the world’s leading messaging app company, with only Chinese companies truly challenging it (South Koreas’ Kakao Corp, Japan’s Line and Chinese players excepted). But that shift of user time to under monetized ad platforms threatens Facebook’s ad revenue growth. Hence the focus of music to drive usage back to its core platform where it can generate more ad revenue. Although some have been quick to liken Facebook’s lip sync functionality to Musical.ly and co, in reality it is not competing head on with those apps because it is initially launched as a Facebook Live feature. Betraying Facebook’s strategic imperative of building its Live business. Expect a true Musical.ly ‘killer’ sometime within the next nine months. Facebook is not here to compete with Spotify, but it is here to compete with YouTube and Snapchat and to steal some of the clothes of Musical.ly and co. The currently announced features just scratch the surface of what Facebook can do. In many respects music has taken a series of retrograde steps socially speaking since the days of imeem, MySpace and Last.FM. Now Facebook has picked up the dropped baton and is running with it. Finally for anyone at MIDEM, I will be there from Weds PM to Thursday evening, including doing a keynote Q+A with Napster’s new CEO early Thursday evening. Hope to see you there. My colleagues Zach Fuller and Georgia Meyer are there too, both are speaking, so be sure to say hi. When Facebook flicked the switch on stage two of its Socially Optimized Web Strategy at f8 it was clear that the social network had just found an effective means of embedding itself further into all of our digital lives, by making itself the universal content dashboard. What wasn’t so clear at that time was quite how significant an impact it would have on music services, Spotify in particular. Today Spotify hit 20 million monthly users on its Facebook app, having added 500,000 new users in less than two weeks, from the 3rd to the 15th of May (see figure 1). Spotify has added 1.5 million users since the end of April, representing a growth rate of 8%. That compares to 0.5 million new users and 4% growth for the entire month of May in 2011. 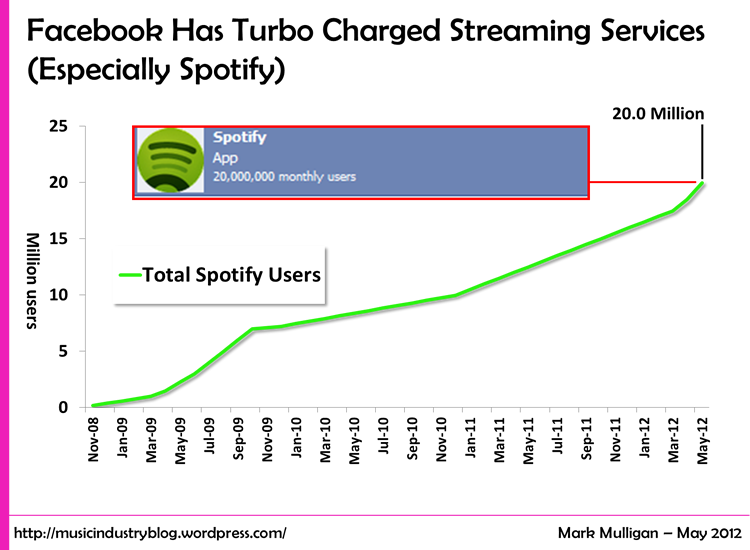 Facebook integration, coupled with launching in the US has turbo charged Spotify’s growth trajectory. And yet, as impressive as Spotify’s total user growth is, it is only par when compared with other streaming music services. Looking at the growth in total users by month since launch date of service (see figure 2) Spotify is close to the average for streaming music services. In fact it is only above Pandora and lags imeem and Last.FM, both of whom were once the future too. In favour of Spotify, services like Pandora first launched in the US – a much larger addressable audience – and have unlimited free tiers. Against Spotify, the market is now much more mature in terms of technology and consume readiness. Measuring against current user levels, 20 million users is also a long way south of Pandora’s 100 million users. 3 million paying subscribers is also far off Apple’s 80 million iTunes customers, though the comparison isn’t necessarily apples-to-apples (pun fully intended). All of this is not to say that Spotify’s growth rate should be questioned but instead to put it into appropriate historical context, namely that Spotify is performing at the rate that streaming music services should perform in their first 40 months. Not more, not less. 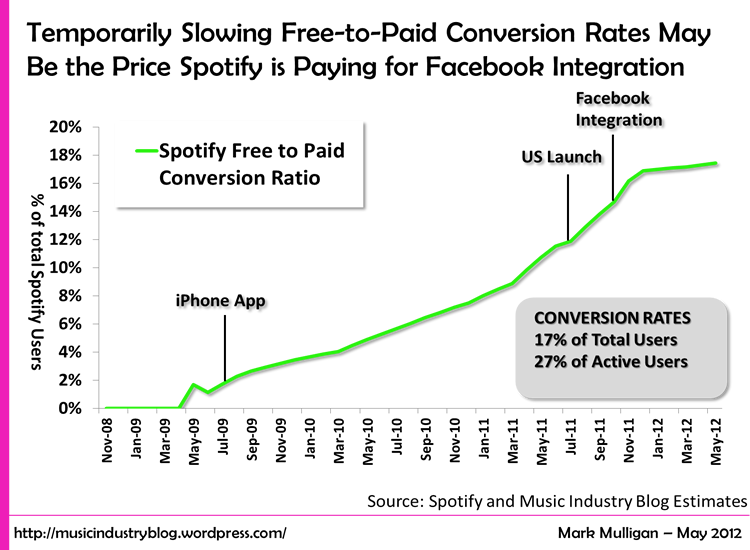 What is different about Spotify, is the need to amass new free users to drive premium subscriptions (see figure 3). 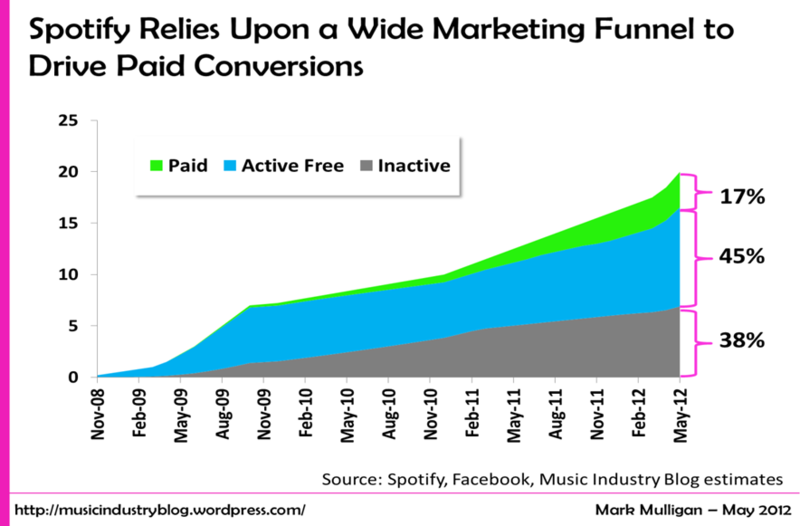 Although Spotify officially quotes 10 million registered users (the same number it first reported in December 2010) it is more instructive to look at paid conversion as a share of the 20 million monthly users reported by Facebook. (Bear in mind that Spotify first quoted 10 million users back in December 2010, long before the US launch or Facebook integration). Even with the 20 million users measure, 17% stands out as a highly successful conversion ratio for Spotify, an affirmation of the Freemium model. Not only that, the conversion rate has grown strongly month upon month. Spotify has been getting progressively better at converting free users to paid. The conversion from active users to paid is even more impressive: 27%. However it is also clear that the acceleration in new user acquisition enabled by Facebook integration is beginning to dent the conversion rate (see figure 4). This is though just a natural byproduct of rapidly expanding the funnel: these new free users need to have time to get hooked on the service and then get migrated over to paid. The rate of new users is so much higher than previously that it will take time for Spotify’s overall metrics to balance out. But that should indeed happen. And if it does , then it augurs well for positive premium growth down the line. If Spotify converts between 17% and 27% of each of the new daily 45,454 users, it will add between 0.7 and 1.1 million new paid users a quarter, or between 4.8 and 4.5 million a year. Assuming a 27% conversion rate of these new active users, Spotify could have just over 8 million paying subscribers by May 2013 and 36 million total users. The lower case, and probably more realistic, 17% conversion rate scenario would result in 6.3 million paying subscribers. Although the rates and ratios will fluctuate over the coming 12 months, these numbers give us a useful directional sense of the long term impact of Facebook on Spotify’s current growth metrics. There remains a big question over the scale of the actual addressable market, i.e. is there a demand ceiling that Spotify will hit somewhere south of the 5 million paying subscribers mark? But ceiling or no ceiling, and low or high conversion scenario, there is one inescapable conclusion, namely that Facebook integration is transforming Spotify’s business, fast. These charts and the above analysis feature in a brand new Music Industry Blog free report: ‘ When 2+2=Free: Making Streaming Music Add Up’. The report is free of charge to Music Industry Blog subscribers. To receive your copy simply subscribe to email updates of this blog using the box to the upper left of this page. 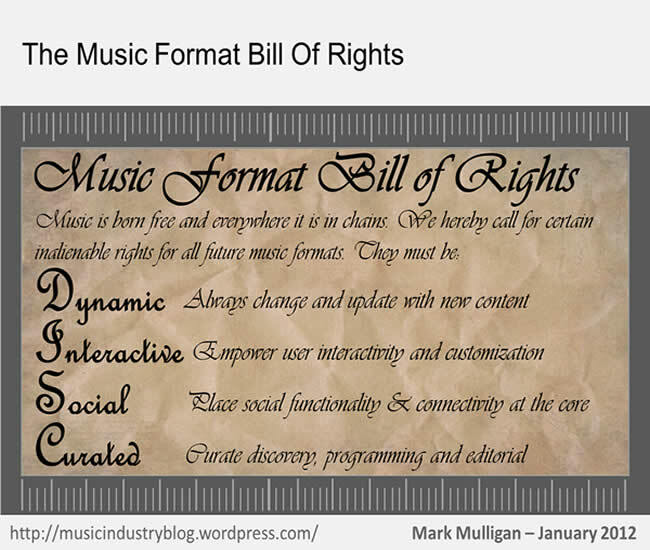 Today I have published the latest Music Industry Blog report: ‘The Music Format Bill Of Rights: A Manifesto for the Next Generation of Music Products’. The report is currently available free of charge to Music Industry Blog subscribers. To subscribe to this blog and to receive a copy of the report simply add your email address to the ‘EMAIL SUBSCRIPTION’ box to left. The music industry is in dire need of a genuine successor to the CD, and the download is not it. The current debates over access versus ownership and of streaming services hurting download sales ring true because a stream is a decent like-for-like replacement for a download. The premium product needs to be much more than a mere download. It needs dramatically reinventing for the digital age, built around four fundamental and inalienable principles of being Dynamic, Interactive, Social and Curated (D.I.S.C.). This is nothing less than an entire new music format that will enable the next generation of music products. Products that will be radically different from their predecessors and that will crucially be artist-specific, not store or service specific. Rights owners will have to overcome some major licensing and commercial issues, but the stakes are high enough to warrant the effort. At risk is the entire future of premium music products. Dynamic. In the physical era music formats had to be static, it was an inherent characteristic of the model. But in the digital age in which consumers are perpetually online across a plethora of connected devices there is no such excuse for music format stasis. The next generation of music format must leverage connectivity to the full, to ensure that relevant new content is dynamically pushed to the consumer, to make the product a living, breathing entity rather than the music experience dead-end that the download currently represents. Interactive. Similarly the uni-directional nature of physical music formats and radio was an unavoidable by-product of the broadcast and physical retail paradigms. Consumers consumed. In the digital age they participate too. Not only that, they make content experiences richer because of that participation, whether that be by helping drive recommendations and discovery or by creating cool mash-ups. Music products must place interactivity at their core, empowering the user to fully customize their experience. We are in the age of Media Mass Customization, the lean-back paradigm of the analogue era has been superseded by the lean-forward mode of the digital age. If music formats don’t embrace this basic principle they will find that no one embraces them. Social. Music has always been social, from the Neolithic campfire to the mixtape. In the digital context music becomes massively social. Spotify and Facebook’s partnering builds on the important foundations laid by the likes of Last.FM and MySpace. Music services are learning to integrate social functionality, music products must have it in their core DNA. Curated. One of the costs of the digital age is clutter and confusion: there is so much choice that there is effectively no choice at all. Consumers need guiding through the bewildering array of content, services and features. High quality, convenient, curated and context aware experiences will be the secret sauce of the next generation of music formats. These quasi-ethereal elements provide the unique value that will differentiate paid from free, premium from ad supported, legal from illegal. Digital piracy means that all content is available somewhere for free. That fight is lost, we are inarguably in the post-content scarcity age. But a music product that creates a uniquely programmed sequence of content, in a uniquely constructed framework of events and contexts will create a uniquely valuable experience that cannot be replicated simply by putting together the free pieces from illegal sources. The sum will be much greater than its parts. I have a favour to ask of you: I have the germ of an idea which I am developing for a forthcoming report and I want try it on you. So please let me know your thoughts. First a few thoughts on the cloud…. The cloud is of course is already with us, but largely as a collection of disparate connected music experiences (e.g. Pandora, Spotify, Comes With Music) rather than as something more all-encompassing. I’m skeptical of the truly ubiquitous experience happening anytime soon. Indeed, the practical limitations on ubiquitous connectivity mean that connectivity will in fact fall short of ubiquity for some time (more on that from my colleague Ian Fogg later this year). But it is clear that over the next few years more of the dots will be joined. And sometimes the dots will be joined by innovative workarounds, such as Spotify’s ‘offline’ streaming solution. Readers of my Music Product Manifesto will know that I’m a stronger believer in the near term potential of social in music experiences than I am of the cloud. In order to effectively compete against free music products need to create new, unique music experiences and social interactivity is a key means of achieving this. If you put a $0.99 iTunes download against a $0.50 Amazon download against a BitTorrent $0.00 download the BitTorrent download will always win. Future music products need to do more. Formally layering social functionality into the experience is key here, both to add a connected element but also for discovery. With so much noise online, trusted taste makers (or ‘curators’ as Nettwerk Music’s Tony McBride calls them) are key. And who do we trust most for recommendations? People we know and connect with. My thesis is that these two dynamics not only don’t have to be, dare I say it, disconnected, but that they should be inextricably linked. Their paths should be moulded together. The likes of Last.FM (Audio Scrobbler) and Apple (Genius) have started to demonstrated the power of ‘Crowd Sourcing’ in the music discovery journey. Spotify and YouTube and many others are showing the way for cloud based music experiences. The time has come to be the crowd in the cloud. Social tools and media are of course already inherently connected and inherently cloud based, whether it be Facebook, Twitter or MySpace. When woven into the fabric of a digital music offering they bring that experience to life. In a connected music experience that exists across multiple devices and multiple platforms, social connectivity is more important than ever. Social connectivity turns a bored 10 minutes waiting for a train into a connected a fun engaged interaction with a friend, sharing playlists on MySpace. It transforms looking for something new to listen to on your iPhone into a social discovery journey. This idea’s still taking shape, so I’d love to hear your thoughts. I’ll post further on the concept as it evolves. MySpace today launched its UK music offering, over a year after its US launch. However tempting it is to position this as a Spotify challenger (and the BBC and many others do) it simply isn’t. It isn’t, both out of intent (more on that later) and also out of poor execution (more on that later too). Music matters to MySpace more than ever before. Why? Because it is has lost the race with Facebook for social networking supremacy, in fact Facebook is about to lap MySpace. But MySpace remains undisputed leader as the global social music destination (a position consolidated by the recent acquisitions of iLike and imeem). If you are a band, you’ll have an artist page because that’s where the online music audience coalesces for engaging with bands. Sure there are better, more innovative alternatives, but MySpace has the momentum and the scale. And if you’re an artist looking to reach audiences that is exactly what you want. Bebo and Facebook have both tried to challenge MySpace’s position here but have not had meaningful success (a recent report indicated that 77% of Facebook fan pages have less than 1,000 fans). So whilst the mainstream social networking momentum may be shifting elsewhere, MySpace remains at the heart of the social music experience. In many ways MySpace is in a similar position too YouTube, which is getting left behind in the online video revolution as the momentum moves beyond skateboarding dogs to full length shows on the likes of Hulu and iPlayer. But it remains the number one destination for music video. So MySpace and YouTube both find themselves repositioning around music, perhaps more out of necessity than out of choice. Strategically: MySpace is building its music experience firmly around social and community. It knows that is its differentiation point and the essence of the artist-fan relationship which MySpace delivers. So the music experience is wedded to that. Spotify is a straightforward music experience. No community (at least within the application itself) and no artist-fan dialogue. So the music content is deeply integrated into the social experience (hence the focus on playlists for example). Execution: But it is also not a direct challenger to Spotify because it isn’t executed well. That deep integration brings great challenges also. If you are looking for a Spotify-like experience on MySpace, you won’t find it. But the odds are you won’t easily find the music you want either. For example, MySpace poster girl Lily Allen is one of the featured artists on the home page (despite her just announced career break), but finding her music isn’t easy. As you can see from the screenshot at the bottom of this post, you have to go all the way to the bottom of the page to find a genuine song. 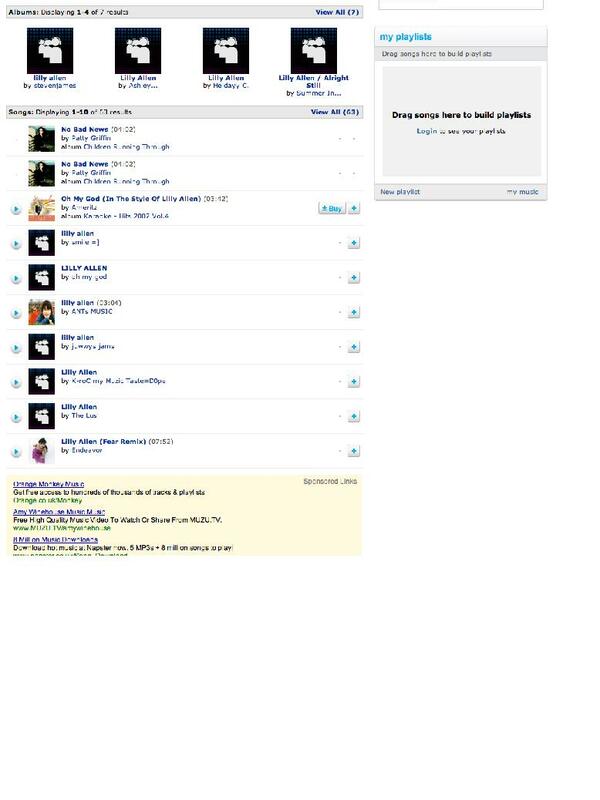 And the top result, which is out of shot here, is for the ‘This is not the real Lily Allen’ profile page. Those results below are all songs by unknown and small time artists. Yes that is part of the essence of MySpace’s music community, but they shouldn’t be pushing the genuine Lilly Alen track to the bottom. Also note all those ads by competitor music services! All that said, MySpace Music is an important part of the digital music landscape and I expect to see much more fromo them over the coming 12 months as the leverage the iLike and imeem assets to the full. But they also need to innovate hard. There is a huge amount of activity in this space and MySpace can’t simply wait for each of the competitors to fail and then buy them up on the cheap. The fact MySpace music is a Joint Venture sets them in good stead, with reportedly significantly below market-rate license fees (as this artist’s account also seems to suggest). But MySpace doesn’t have a JV by accident, its financial security makes MySpace an important partner for the music industry. It can plan ahead with MySpace in a way that you cannot with an unproven start up, however well funded it may be right now. Here’s hoping MySpace use that power to the full and don’t rest on their laurels. So Why Did Apple Approve Spotify’s iPhone App? So they did it: Spotify got their iPhone app approved and it is available today (as is the Android app). I won’t pretend I’m not surprised. I felt this competed too directly with core iTunes music player functionality for Apple to approve it. And of course Spotify isn’t even available to the vast majority of Apple customers so they wouldn’t be affected by lack of availability to kick up a fuss. So just why did Apple approve it? Well my take is that this reinforces Apple’s play as a platform, albeit a heavily controlled one. They want to ensure that the iPhone and iPods are the places where you can find the best music experiences. Last.FM, Pandora et al enhance and deepen that music experience. Spotify will also. But Apple is a company that is as sharp as they come and this is a very calculated move. The Spotify app is free to download by only works for Spotify customers that pay 9.99 a month. So it is only going to be a pretty small number of people who’ll actually get exposed to this, a tiny tiny fraction of Apple’s installed base of portable device customers. So Apple get to look inclusive and welcoming, with minimal impact on their business. The news that Spotify’s mobile app is now available for the Android platform, coupled with an anticipated Autumn US launch, are both part of the music service’s inexorable rise and media interest. Spotify undoubtedly has momentum and potential in abundance. But, even without considering the issue of cash burn, it is also important to keep a sense of scale. Spotify has done a great job of acquiring a sizeable audience after a short period of time, but needs many users more before it can be considered on a par with some more established services that get a lot less attention (these days at any rate). In the chart below I have mapped the number of users of Spotify and a number of other key free music services, each from launch. What is clear is that Spotify has made a solid start is growing at a stronger rate than Pandora was at the same stage. If Spotify ever reaches Pandora’s scale and business model viability, it will rightly be considered a success. 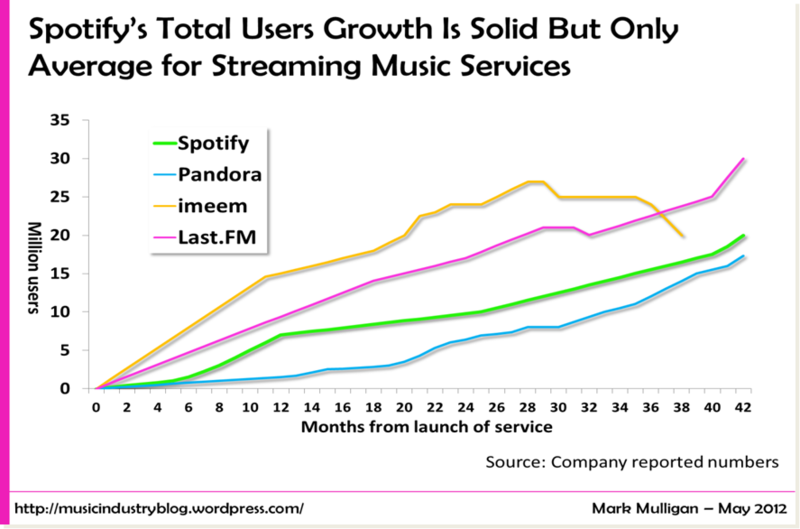 But it is also clear that other services like Last.FM and imeem grew more quickly. And just to put the absolute scale of Spotify into perspective, the Pandora iPhone app alone is mapping almost exactly in line with Spotify’s entire user base. (No coincidence of course that Spotify see the iPhone app as a crucially important ticket to further success). So what can we conclude from these numbers? Spotify will need to accelerate its revenue model maturation if it is going to be able to sustain this projected level of growth. Pandora closed its non-US operations when it couldn’t strike deals with rights owners that would enable it to operate profitably in international markets. Pandora has long focused on building financially sustainable audiences, a strategy echoed by We7 in the UK. Spotify has run a fast first lap, but it is a very, very long race. The Financial Times today ran a story about Spotify being close to securing substantial extra funding, and I for one hope they secure it: the music industry needs Spotify to get a decent shot at being a success. It’s no secret that ad-supported music services have numerous challenges, not least a softening ad market. It’s equally no secret that Spotify needs to make its premium business a success. But building the ad business and the premium revenues will both take time. Until those are fixed every new user for Spotify is cost to the bottom line. So it would be a real shame for Spotify to have to put the brakes on its audience acquisition given that they have that most sought after of dynamics: momentum. At the same time however, I think it is important to put Spotify’s nascent European adventure into perspective. Spotify itself is not about to become ‘the future of the music industry’ but it does stand a decent chance of being one of the first truly mass market online services. As you can see from the chart below, Spotify’s user base growth is impressive. (It is important to clarify that the current European user number is the 4 million as shown in the chart, not the 6 million reported elsewhere. Spotify clarified to me that those 6 million numbers are not correct and are ‘unsubstantiated’). But just what does 4 million really represent? Well across the 6 European markets Spotify is available in (Sweden, Norway, Finland, the UK, France and Spain) it represents 3 percent of all Internet Users and in the UK it represents 5 percent. Those may not sound particularly high but are impressive given that the service only launched 9 months ago and only formally came out of invite stage this year. By way of comparison it took Pandora a year to reach 1.7 million users, representing 1 percent of US Internet users. So it is clear that Spotify has momentum. But it is too early to say that it is a success. Pandora now has 30 million users and its iPhone app users alone out number total Spotify users by more than a million. Also, there are plenty of streaming music services with many more users, such as imeem (25 million in March), Last.FM (20 million in March) and iLike (30 million in March). Spotify has some distance to go before it reaches the levels of those services, none of which are being talked about as the future of the music industry…at least not anymore. And there lies the rub. Each of those services had their time in the spotlight. For a while each was seen as the shape of the future. They still have plenty to offer, but the attention has shifted elsewhere, due in no small part to the fact that their user growth reached a plateau in the 15-20 million range. Launching in the US and having its iPhone app approved by Apple would both be great ways of moving towards achieving those three aims. Spotify has made a great start but it hasn’t even finished the first lap yet. Here’s hoping that they’ll have made more substantial progress before the backlash begins. Because one thing my years of market watching have taught me is that the higher a service is built up, the farther it has to fall when it is pushed off the top by many of the very same people that put them there. Firstly let me apologize for not having posted for a while on here, and thanks to the messages and emails from those prompting me to get posting again. I’ve been snowed under with project work but normal service will now resume! Today I ran a series of panels (well, a succession of thinly disguised vendor presentations) at Music Week’s Making Online Music Pay conference in London. Here are my highlights of the day. First up was Andy Burnham, the UK Secretary for Culture, Media and Sport. I have to say I was really impressed by him, he came across as a genuine guy with a real interest in and understanding of the media business. His speech was a master class in how to land a series of killer punches by nuanced implication. He was keenly aware that the audience was hoping for some pointers on what the final Digital Britain report is going to look like. He said he wasn’t going to be able to do so, but went on to give some pretty solid indications, largely by ruling out what wouldn’t be there. So in short, ‘Three Strikes You’re Out’ is, well, out, and ‘Speed Bumps’ are in. As with any good compromise both sides will doubtlessly be dissatisfied with the solution, but my first instinct is that this is a workable, realistic, solution that should deliver results. Assuming of course (and this is crucial) that these measures are backed up with compelling legal services for the ISPs. The BPI’s Geoff Taylor suggested that ISPs may be able to get compensated for converting file sharers to legal services. This is innovative thinking that shows understanding of the need for their to be meat in the game for the ISPs (who when it comes down to it are facing a similar race to the bottom as the labels are). Here’s a left field thought (well, wild hypothesizing): Spotify’s long term future road map incorporates MP3s and the viability of the business model is defined by becoming part of subsidized ISP bundles. Just a thought…. Back to the real world and Andy Burnham. He made an apparently harmless well meaning comment that the debate needs to be “internationalized” and that “we need to find the right balance and then internationalize that”. Which is all well and good, but when coupled with his comments about graduated responses effectively dismisses the recently pass French ‘Three Strikes’ legislation as bunkum. What we might be seeing here is the start of a political digital face-off between France and the UK. France used its Presidency of the EU to drive the debate on defining European policy on ‘creative content’ in the digital arena. It looks like the UK government might be planning to use the “Digital Britain” report as a blueprint for a “Digital Europe”….and perhaps beyond. Geoff Taylor also asked Andy Burnham whether the government was still committed to reducing music file sharing by 70-80% within 3 years, now that we’re 1 year into that commitment. The response was that the government would absolutely “not retreat”. Something pretty drastic is going to have to happen in the next 24 months to deliver those results. More realistically the government will change and targets with it. Joining the dots, the consensus from those right in the mix is that the dynamics of ad supported digital music still need further revision if this second wave of ad supported services isn’t to go the same way of Spiral Frog. I had a few people come up to me and question why I hadn’t given my panelists a harder time with more probing questions. They had a point. On reflection perhaps I’m feeling empathy for them in these difficult times? Either way, that’s no excuse. I’ll be back to my old probing ways at the next conference. Thanks for putting me back on course! Oh, and Apple hardly got a mention….even though they account for 75%+ of online digital revenues….times are a changing. Orange today announced they will be ‘exclusively’ providing Comes With Music on the Nokia 5800 in the UK. Finally Nokia’s Come With Music gets the route to market it needs. I’ve long been a strong advocate of CWM and that belief remains intact despite reportedly poor sales to date. Nokia always needed strong channel partner participation to make the service a success. Without the route-to-market, marketing support and – most crucially – subsidy support that the operators provide CWM is left looking like an overpriced, under featured oddity. But with the support of an operator it comes into its own. Orange packages start at just 25 pounds a month. For this consumers not only get a decent number of voice minutes and texts, but they also get the handset for free and unlimited music that they get to own for ever. That is a compelling proposition and offers genuine value for money. Unsubsidized, the cost in Italy for the same handset and music service, but without a voice and text tariff is just short of 500 Euros. The comparison is stark and is central to why CWM has under-whelmed thus far. CWM is an exciting product because, when packaged correctly, looks and feels like free to the consumer. In this context DRM restrictions and a phone that falls short of iPhone sexiness are entirely tolerable. But with a premium price point they become non-starters. CWM, along with the likes of Spotify, We7, Last.FM and imeem, is one of the key weapons that the music industry has in its armoury to fight free with free itself. CWM may not be free, but packaged like this it ‘feels like free’ and that’s enough to have real potential of pulling young music fans away from illegal downloading on a scale that hasn’t yet been achieved.